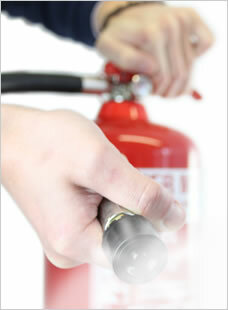 Safelincs has added Jewel Water Mist Fire Extinguishers to its extensive range of fire safety equipment. These ‘no-mess’ extinguishers are ideal for use in kitchens where they can be used on all types of fire including deep fat fryers. Statistics show that more fires start in kitchens than anywhere else. Traditionally, wet chemical extinguishers have been recommended for cooking fires that are being fuelled by oil and fat. They are effective but leave a residue that has to be thoroughly cleaned before any more cooking or food preparation can be undertaken. It may even mean temporarily closing down the kitchen. The Jewel E-Series Water Mist Fire Extinguishers leave no residue so there are no nasty fumes or residues to contend with and the water mist protects the user from heat. The extinguishers are LPCB approved to EN3, come with a five year warranty and have extraordinary extinguisher ratings. The ease of use, and the range of fires they can tackle, simplify training and remove the risk of the extinguishers being used incorrectly. See a video of how the Jewel E-Series Water Mist Fire Extinguisher performs in relation to other extinguishers. The Catholic Church is currently putting its finishing touches on a central purchasing portal for all its organisations in the UK, called ChurchMarketplace. The portal offers all Catholic schools, nursing homes, parishes, churches etc vastly reduced purchasing prices for items from consumables and candles to fire safety and health and safety. We are very proud that we were chosen by the Catholic Church as the provider for all their fire safety and H+S products and services following a demanding selection process. We will now provide ChurchMarketplace with a dedicated fire safety and H+S sub-portal offering our range of fire extinguishers, smoke alarms, emergency lighting and many other products. As to all our other customers, we will be offering the best customer service possible. Every Catholic Church organisation (well over 5000) will order individually, this will play to our strength and ability to tailor the service we provide to meet our customers needs on an individual basis while offering the very best framework contract pricing . We look forward to the launch of the portal, which is scheduled for October and to a long term partnership with the Catholic ChurchMarketplace. How can we help our customers in the worst case scenario – a fire? We have sold you all the fire safety products you need but how can we help you further should you become the victim of fire? Our answer to this question is the introduction of our ‘free replacement after fire’ policy. Safelincs is the first fire safety company to offer this service. This policy is designed to encourage our customers to use all their fire fighting and rescue equipment without any consideration of costs to limit the impact of a fire. We see it also as a way of helping our customers through a difficult time and supporting them through the entire life cycle of the fire safety products sold by us. We hope that our customers never need to use the products to fight or escape a fire, but where they are unfortunate enough to do so we hope that our pledge will help them to return to normal as quickly as possible.